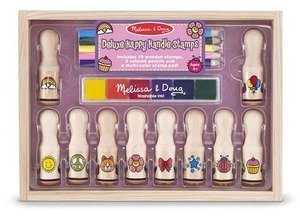 These lovely wooden handle stamps from Melissa and Doug will entertain budding artists for hours. The handles are easy to grip, making them perfect for little fingers. The ten rubber stamps have extra long wooden handles that keep fingers off the ink (which is machine washable). This Melissa and Doug set comes in a beautiful wooden storage tray and comes with a six-colour ink pad and 5 colouring pencils. The ten stamps include rainbows, balloons, peace signs, stars, a smiling sun, and much more. The Melissa and Doug wooden handle deluxe stamps will entertain budding artists for hours. The handles are easy to grip, making them perfect for little fingers. The ten rubber stamps have extra long wooden handles that keep fingers off the ink (which is machine washable). This Melissa and Doug set comes in a beautiful wooden storage tray and comes with a six-colour ink pad and 5 colouring pencils. The ten stamps include rainbows, balloons, peace signs, stars, a smiling sun, and much more.